Neptune's Great Dark Spot, accompanied by white high-altitude clouds, as seen by a Voyager spacecraft. Unlike their rocky counterparts, gas giants have long challenged astronomers when it comes to calculating their rotation. But Erich Karkoschka, of the University of Arizona, managed to use these shifting features to calculate how long it takes Neptune to rotate on its axis and complete one day: 15 hours, 57 minutes, and 59 seconds. A video of the Neptune spinning conveys the sheer speed at which the giant planet rotates. Neptune completed its first orbit around the sun since its discovery in July, shortly before the discovery. 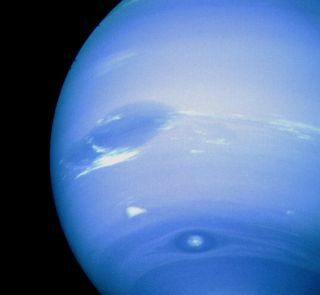 Karkoschka examined more than 500 images of Neptune that were taken by the Hubble Space Telescope. Two cloud formations, similar to Jupiter's famous Red Spot, stood out — the South Polar Feature and the South Polar Wave. After studying the Hubble images, taken over a span of 20 years, Karkoschka determined that these distinct features appeared precisely on schedule. He decided to widen his search to a series of more detailed images taken in 1989 by NASA's Voyager spacecraft. In these images, Karkoschka found six additional features on Neptune that rotated with regularity. [Infographic: Inside Gas Giant Neptune]"I thought the extraordinary regularity of Neptune's rotation indicated by the two features was something really special," Karkoschka said in a statement. "Now we have eight features that are locked together on one planet, and that is really exciting," Karkoschka said. The details of the study were published in the September edition of the journal Icarus. Different images emphasize the features on Neptune. By tracking features such as the Great Dark Spot and South Polar Feature, astronomers were able to refine measurements of the length of Neptune's day. As the Voyager 1 and Voyager 2 spacecraft flew past Saturn, Uranus, and Neptune in the 1980s, they captured radio signals produced by the gas giants' magnetic fields. But their information, which was originally used to calculate the rotation of the outer planets, was scanty. "Voyager 2 only flew by Neptune, so its measurements are limited," Ravit Helled of Tel-Aviv University in Israel told SPACE.com in an email interview. NASA's Voyager 1 and Voyager 2 spacecraft were both launched in 1977 to study Jupiter, Saturn and their moons. Nearly 34 years after their launch, the two probes continue to deliver key information as they journey out to the solar system's edge. Helled, who was not part of Karkoschka's research, studies the formation, evolution, and rotation of the planets. Fifteen years after the Voyager flyby, Cassini's trip to Saturn revealed a complex magnetic field that had slowed down slightly. The large mass and angular momentum of the planet meant it was extremely unlikely that the planet's rotation would have decreased so noticeably. Adding to the confusion, a later discovery by Cassini revealed that Saturn's northern and southern hemispheres were rotating at different speeds. These differences on Saturn were considered likely on Neptune, and when estimates of Neptune's day were affected by suspect radio signals, astronomers needed another way to calculate how long it takes the planet to rotate on its axis. Enter Karkoschka's painstaking analysis of Neptune's visible features. This method will help astronomers understand more than just how often the sun rises and sets on the Neptune, the researcher said. Refined measurements of the blue giant's rotation will help astronomers gain a better understanding of how its mass is distributed. A faster rotation implies that more of the mass is closer to the center than previously thought, which could change existing models of the exterior planets. "Uranus and Neptune are extremely interesting planets, and we must know more about them," Helled said. "Especially now, when so many planets outside the solar system are discovered and there is a great effort in understanding the nature of planets."